"If you’re lying, I’ll be back"
No, that’s not a line from either of the ‘Terminator’ films. 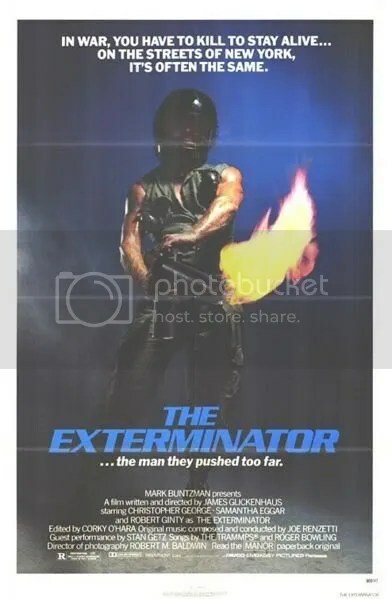 It’s from ‘The Exterminator’ (wonder if Schwarzenegger ever got round to watching this film…), a fantastic exploitation film from 1980, directed by James Glickenhaus and starring Robert Ginty (who also starred in the post apocalyptic Italian Sci-fi ‘Warrior Of The Lost World’, featured in an earlier post). Very much of it’s time (the American soldiers Vietnam experience is a theme of the film) and borrowing from other brutal revenge / vigilante films of the time (e.g. the Michael Winner / Charles Bronson ‘Death Wish’) ‘The Exterminator’ satisifies as a crude, violent action thriller. The film kicks off in Vietnam, where John Eastland (Ginty) and his buddy Michael Jefferson (Steve James) are prisoner of the Vietcong. During this opening scene there is a brutal throat slahing / decapitation of an American soldier where the head flips back with the force of the blow (all captured in slow motion). It certainly grabs the attention (the effects were done by Stan Wilson, who later went on to work on blockbusters such as ‘Terminator 2’). Eastland and Jefferson make it back from Vietnam, but find the seemingly lawless streets of New York as hazardous a terrain as Vietnam. It is here that a gang called the ‘Ghetto Ghouls’ take revenge on Jefferson for his part in foiling a robbery. This events leads Eastland on the path to revenge his friend, and it encompasses not only the ‘Ghetto Ghouls’, but Organised Crime as a whole, including protection racketeers, Mob bosses and leaders of child prostitution rings and their clients. There’s an FBI involvement in trying to track down the vigilante that doesn’t amount to much. The main action is centred around Eastland, and his vendetta. Its primal, thrilling stuff, seeing really bad people get really bad things done to them. To dismiss this as a bad movie is a nonsense. It’s a tough thriller, with reasonable acting and fast pacing. Well worth a look. It left it’s mark. 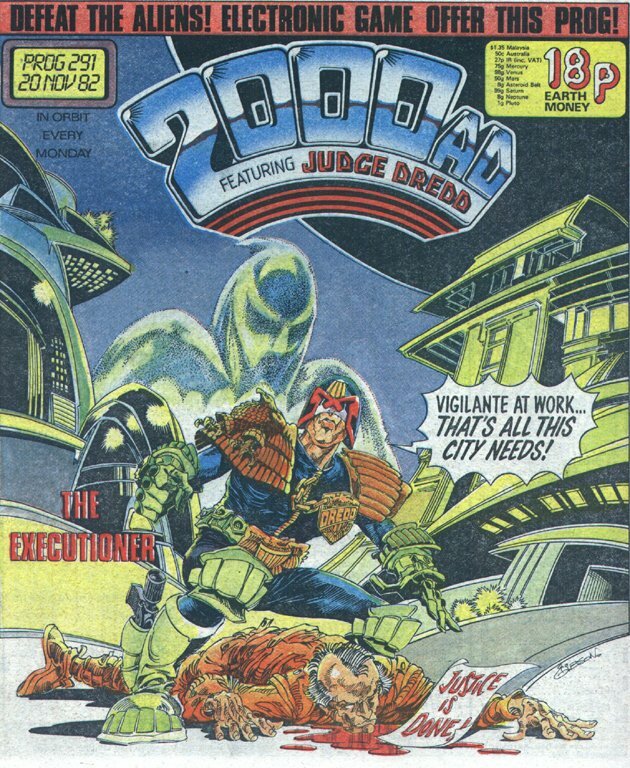 Apparently even Judge Dredds writers were inspired by ‘The Exterminator’ to produce a story called ‘The Executioner’, about a femal vigilante in Mega City One (as I recall, she was a trainee Judge at some point?). In a recent post I talked about my enthusiasm for the George Miller film ‘Mad Max II’, and how it spawned several derivitive Italian Sci-Fi / exploitation films in the early to mid 80’s. 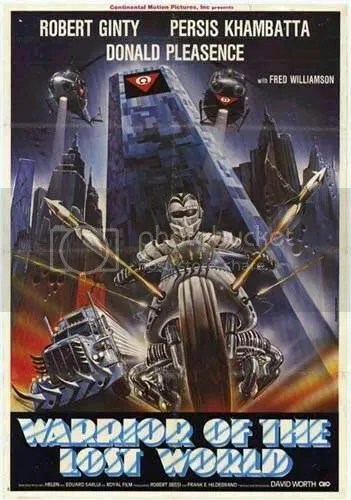 One of the lesser mentioned was ‘Warrior Of The Lost World’ and starred American actor Robert Ginty, star of the exploitation video classic ‘The Exterminator’ (more of that later). As we can see, the poster art is fantastic, and promises more than the low budget can deliver. We are talking low budget Italian exploitation at its cheapest and most absurd. You either get it or you don’t. I tend to love these things. The film begins with a screen crawl (like the ones you see in the Star Wars films) thats HEAVY ON THE EXPOSITION. Check out the back story!! “In another time,in a distant land… Generations after the radiation wars and the collapse of nations, government, finance, and communications, there came into existence a new Dark Age of Tyranny. As each Sector adapted its’ own rules for survival, the evil despot PROSSOR brought to power a Congress to enforce his “Laws and Obligations” and armed a deadly Militia, The Omega, to destroy the Outsiders who were trying to establish a more tolerant society- The New Way. The region beyond the control of The Omega is the Wasteland, a forbidden zone populated by roving tribes of desperate Marginals who engage in a barbaric struggle for territory and survival. Meanwhile, high in the mountains, living among the ruins of past civilizations, dwells a small group of Mystics called the Enlightened Elders. It is here that the Outsiders, led by McWAYNE and his daughter NASTASIA gain inspiration in their struggle against PROSSOR and The Omega. What a stroke of luck that the ‘Rider’ has a vehicle that produces subtitles on its little mounted screen. ‘Bingo’ indeed. This was how the Omegas enforced their law on the lawless post-apocalypse world. It was eventually sabotaged by ‘Rider’ by pulling out some circuits from ‘Megaweapons’ underbelly. 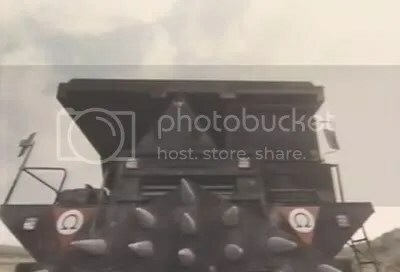 Bit of an issue for the designers of the ‘Megaweapon’, that they had allowed Single Point of Failures into their creation. This is one of those films that it is ‘so bad it’s good’. Worth hunting down. 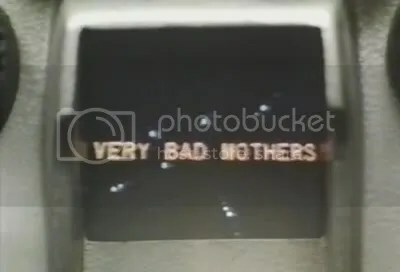 Also, Mystery Science Theater 3000 featured it as one of the films they viewed (and gently took the piss out of). As I mentioned earlier, I intend to write something about McGinty’s magnum opus, ‘The Exterminator’, soon.